Hey Peeps! This week we are sneak peeking our CHA release. 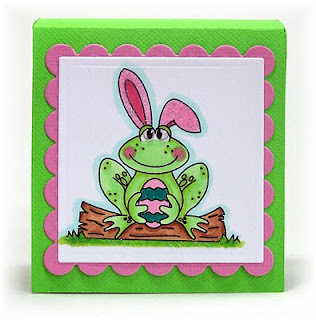 We have 24 brand new stamp sets available at your favorite stores next week! This was one of the Make and Takes at our CHA booth. 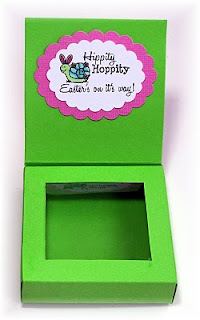 The little Shaker box is a Sizzix Big die. I love it! You can get two out of a 12x12 piece of cardstock. The top opens up to a clear window so you can see the treats inside. I love this frog! Isn't he cute? He thinks he's a bunny.... a bunny with sparkly fluffy ears! The whole set is just adorable! I can't wait to show you the entire set! Our Sparkly Fluff was a huge hit at CHA... have you tried it yet? 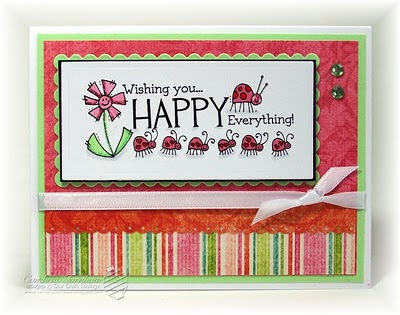 It's so easy to use and adds such texture and fun to your projects. Just use a Quickie Glue pen, sprinkle it on, then tap off the excess... in a few seconds and it's ready to touch! Want to see more sneak peeks? Head over to The Lounge for peeks all week long. 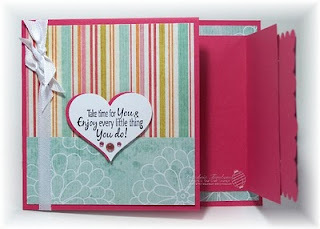 Our design team has been working like crazy to make all kinds of wonderful eye candy with the new release. There are links to their blogs on the side bar. Thanks for visiting. My house was full of teenagers this weekend. The twins had a blast and they even ate the cake I made! I'm NOT a baker... a stamper, but not a baker. I still can't believe my babies are 13. 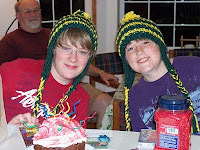 Here is a photo of our birthday boys wearing the Oregon Duck hats my Mom knitted for them. It was a great day. 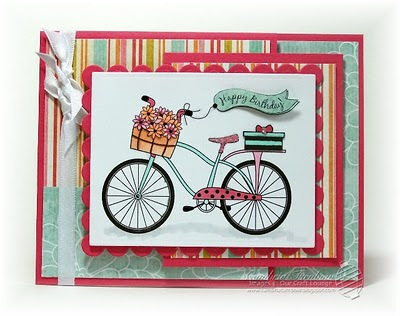 It's so much fun how some of our stamp sets come together. This one was especially fun. I loved the artwork Marianne sent to us, but it just didn't stand alone. We are lucky to have a group of friends who help us out with a lot of concepts for our sets. This one, I have to say, is all my friend Bev Barton. We call her the sentiment Queen. One look at the set and she totally just started filling our ears with wonderful sentiments that match perfectly. It's one of my favorites from our CHA release. 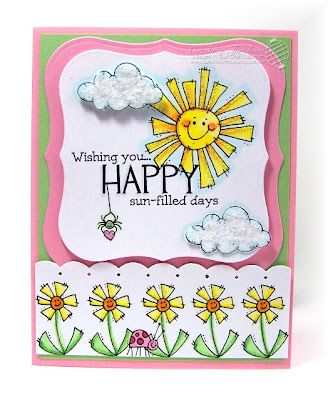 You can mix and match the sentiments to mail some sunshine and cheer up anyone instantly! eP used this cute set in a bundle at the SCS Supershow booth. For a limited time you can purchase that kit.... and own this set BEFORE our release! Click here to check it out! Hope you have a wonderful weekend. Today my twin boys turn into official teenagers! YIKES... I don't know where the years went. I'm off to make a HUGE cupcake cake for each of them! We'll start sneak peeks on Monday... I can't wait to show you our new release! Don't Miss the CHA Bundle! Can't wait to get your hands on the Our Craft Lounge CHA release? Here's your chance to get one of the cutest brand new set called Sunshine Cheer! Partnering with Our Craft Lounge(OCL) for a fun Make & Take at the Cra ft SuperShow, a new OCL stamp made its debut. The new set is called Sunshine Cheer. We bundled up a kit from the Make & Take that was sponsored by eclectic Paperie. We are making these kits available for you to purchase. We have a limited quantity so when they run out, they are gone. I'm home from CHA and catching up! WOW, what a trip! I met so many wonderful people and just had a blast in our booth! Sneak Peeks start next week...... I can't wait to show you our release! Thanks for stopping by! I Like Hanging Out With You! Sometimes, you just need to take a break. That's how my day went yesterday. I have tons of work that still needs to be done for CHA, but I just needed a break. What better way to take a break than to sit and color! Over the Holiday , Averie and I were invited to hang out with two of our favorite friends, Nancy Morgan and her daughter Megan. Megan is an amazing stamper... just like her Mom. 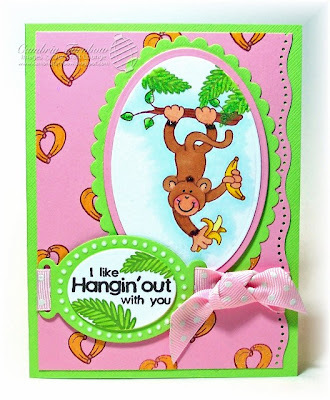 She had made a card using this set (Jungle Love) and colored her background just like this (I totally copied her). The heart bananas are colored with an atyou Spica Pen. The shimmer and shine is like ... BAM! Bright banana background baby! It makes for a fun card. Thanks for the awesome idea Megan! 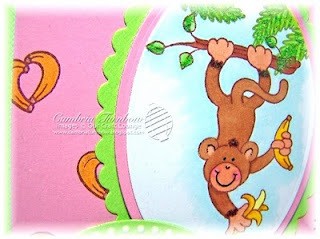 Of course I added Sparkly Fluff to the leaves and the monkey with my Quickie Glue Pen. So, that's all the monkey-ing around I could do... time to get back to work. Hope you have a great week, thanks for stopping by! With a little Happy Birthday to me! Yep, me and Evlis, we share the same birthday! :) Thanks for the wishes.. it started my day with a HUGE smile to open my mail to so many Happy Birthday's. I count my blessing so often for such wonderful friends! You guys are awesome! This is another Joy Fold, same as the previous post. Again, I used those wonderful magical Snap Magnets. I LOVE those things... have I told you that? One is hidden under that heart with the sentiment and the other under the main image. SNAP... can you hear it? LOVE THEM! Have a wonderful day my friends! Thanks for making my birthday special! Good morning stampers! I still can't believe it's 2010 and that CHA is just a few short weeks away! I'm really going to try and post at least once a week, but I am MEGA busy. Beate and her sketch team are all busy too, so we are all taking a break until after CHA. I've been working hard on finishing up our new CHA release and I'm uber excited about it! I can't wait to show you all what we have coming this year! January is filled with birthdays! I have five family members and four friends who all have January birthdays. I hadn't had a chance to play with this awesome set that came out in our last release called Out For a Spin. Now, I'm addicted. How much fun is that bicycle! Kisa and I will be doing our class at Memories of Time this Saturday featuring this set. We'll show you those projects (designed by Kisa) soon. 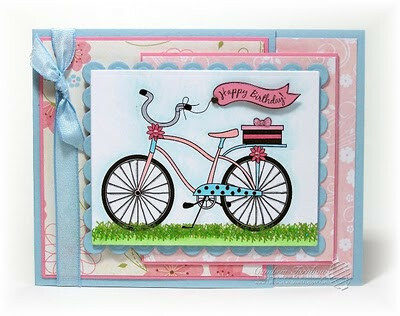 This card is a Joy Fold, designed by my good friend Valerie Stangle. Instead of using ribbon for the closure, I used my all time favorite Snap Magnets by Basic Grey! One is hidden under the main image, and the other under that heart. I LOVE hearing that little snap noise as it magically snaps closed! They are super thin, and small, so you can hide them under paper, or just about anywhere. The heart is from a very cool new punch I got made my Fiskers. Two handles and a little squeeze and it pops right out! Plus they come in nesting sizes... pretty cool! Paper: MME, Pretty Please, Prism Cardstock, Neenah White. Other: Cotton Candy Sparkly Fluff, Quickie Glue Pen, Sakura Black Glaze Pen, Rectangle Nesties, Snap Magnets, Foam Dots, Satin Ribbon, Kaiser Rhinestones, Fiskers Heart Punch, Zip Dry, Scor-Pal. Thanks for visiting today! Have a super day! I love that sentiment! 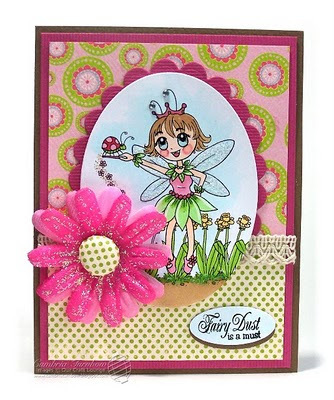 Fairy Dust IS a Must! Happy 2010! 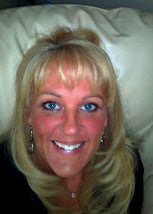 I'm going to try and be a better blogger this year...starting right after CHA. It's been a big adjustment this past year for me and for my family, but I think we've all adjusted. Now to find more stamping time. I'll work on that too! One of the things I did during the Holiday break was go through my stampin room and CLEAN! I love my Mom...she came over and spent FIVE days helping me organize, and purge. It was not easy, but I did very well... better than she thought. I'm having a big garage sale after CHA... let's see how much stuff I drag back to the house! LOL. 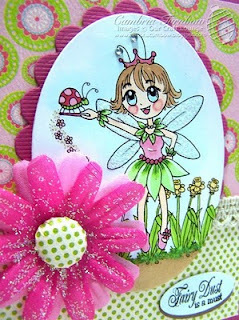 I found these cute flowers in my stash with Fairy Dust already added! I don't know who made them, I think maybe Doodlebug? Perfect for an image I had already colored.. don't you think? 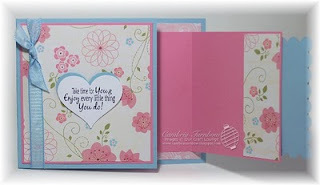 I used my I-Top Brad Maker to make the center of the flower with the opposite side of the designer paper. Paper: My Mind's Eye, Bazzill, Neenah White. Other: Oval Nesties, Crafty Sparkles, Sparkly Fluff, Quickie Glue Pen, Maya Road Trim, I-Top Brad Maker, Small Brad, White Gel Pen, Kaiser Rhinestones, Flower, Zip Dry, Scor-Pal. Hope 2010 is sprinkles with Fairy Dust! Thanks for visiting me today!